Both novice and more advanced weight lifters can use this beginning resistance-training program. We recommend beginner’s start with simple soup cans (or equivalent) and work your way up to heavier items/weights. Regardless of the modalities used (soup cans, dumbbells, etc. ), the style is very effective. 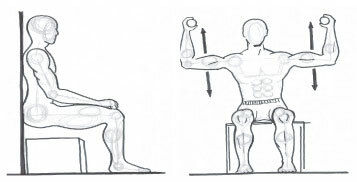 It is a variation of weight lifting technique called Timed Sets or Time Under Tension. Perform 2 sets of each exercise for 40 seconds each. Followed by 60 seconds of rest. We are not counting repetitions with this particular techniques: we are just doing the repetitions in a slow and controlled fashion for a total of 40 seconds a set. To advance your program, we recommend one of two things: increase the amount of resistance for the same time period, or keep the resistance the same and increase the time. This should be done with the set becomes too easy, and you no longer feel you are putting forth an aggressive effort.